For your outdoor parties and soirees, pick from our range of bar and counter stools. 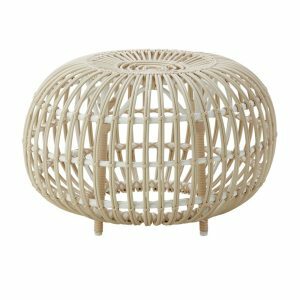 We also have the perfect stools and footstools for a casual outdoor seating area. 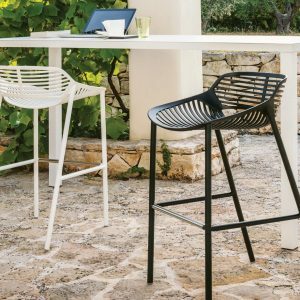 Fabiia’s range of metal outdoor bar stools like the Forest and Rion, or our outdoor wicker bar stools like the Simone are entirely designer made. Designed and crafted all over the world in countries like Italy and Denmark, our range of outdoor stools and bar stools is set to overcome the test of time, both in design and durability. 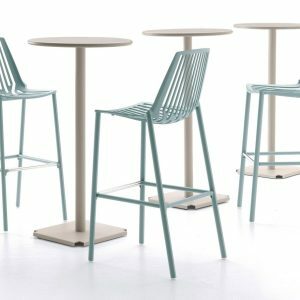 These outdoor furniture stools are suitable for residential, commercial or hospitality sectors. 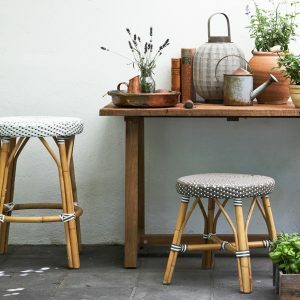 The outdoor stools range doesn’t just cover modern outdoor bar stools, but also manages to include smaller outdoor furniture stools like footstools, ottomans and other low rise options. 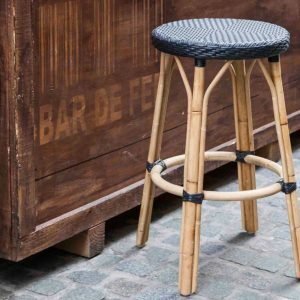 One outdoor wood bar stool is the teak Roger, better suited to lower tables – the Roger is a three-legged patio stool made from reclaimed wood and completely rustic in its design. It is a beautiful piece in our outdoor wood bar stools collection, setting out to lend historic presence and personality to any space it sits within. 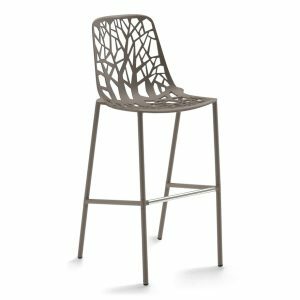 Amongst our tall outdoor bar stools range we have the iconic Forest range. A lattice-work design inspired by the silhouette of sprawling trees in a dense forest, this piece infuses nature with a more geometric structure. 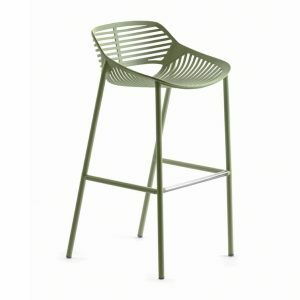 Apart from using it as an outdoor stool or patio stool, the Forest metal outdoor bar stool can also be used indoors. 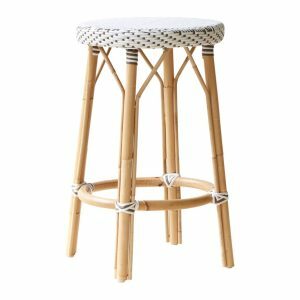 As a modern outdoor bar stool, its design is beautiful enough to stand out, indoors as well as outdoors. 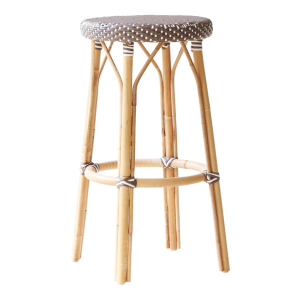 This tall patio stool is available in a high back as well as a low-back option. 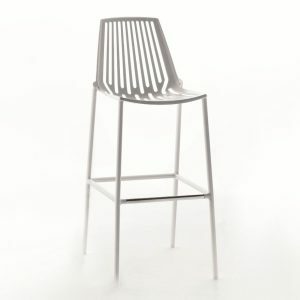 The high-back metal outdoor bar stool is perfect for restaurants and cafes, a sturdy recline, the back is suited to sitting for a longer duration, like the course of an entire meal. The low back on the other hand is better suited to be a bar stool, where occupants would tend not to sit on for long periods of time. Our outdoor wicker bar stool incorporates the Simone range. 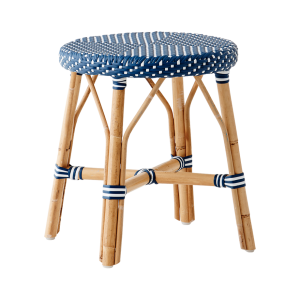 It comes in three height options, namely: the barstool, counter stool and the stool. 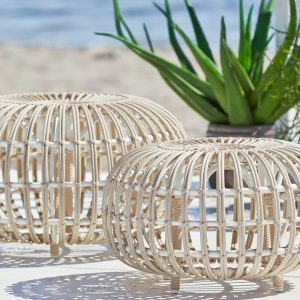 The best part about this range of outdoor wicker bar stools lies in the rattan weave of the seat! The dyed rattan strands are available in lovely colours ranging from azure blue, pure white, cappuccino, salvie green etc. These vibrant colours merge with white speckled accents, giving off an eye-catching vibe. 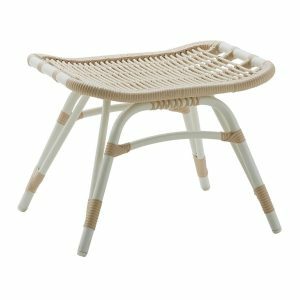 The footstool range come in both rattan and a specialized material called Alu-rattan – fashioned to look like original wicker or rattan finish – the Alu-rattan incorporates an aluminium frame with a synthetic, durable fibre to last in the outdoor climate. 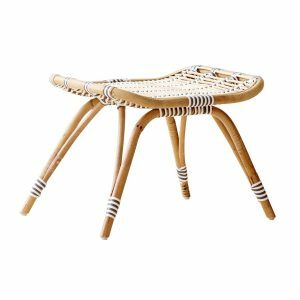 Apart from these, you might also consider opting for a swivel patio barstool. 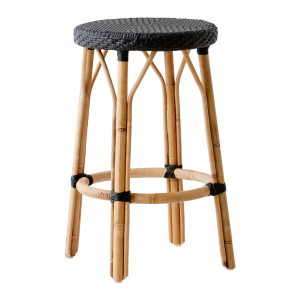 This is a great, functional option to consider while picking out the perfect stool for your restaurant, bar or home.